Located 5.5 miles south of Spiritwood on HWY 378, the Bassingthwaite Farm features 2 quarters of farmlande with a 1,520 sq ft house, barn and corrals, shop, and storage shed. 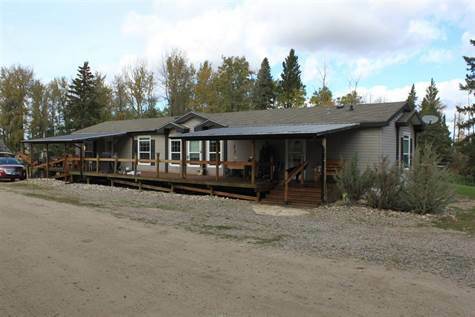 Beautiful 1520 sqft (20ft x 76ft) manufactured home with a 3 bedroom 2 bathroom layout. The kitchen is well lit thanks to the dual skylights and large south facing window in the adjoining dining room. The u-shape kitchen layout provides plenty counter and cupboard space, including a chef’s island with sink and raised eating bar, pantry, built-in wall oven, and stainless steel range hood fan above the built-in cooktop. The cathedral ceiling extends to the adjoining dining room and living room in this open concept design. The master bedroom features a 4 piece ensuite and walk-in closet, with 2 additional bedrooms beside the main 4 piece bathroom and laundry room. Outside is a partially covered 12ft x 76ft south facing deck. - 30 x 80 wood framed shed with metal roof and walls, 14ft wide x 16ft high doors at each end, dirt floor. - Older bungalow with basement was recently lived in, would be good for storage. Seller states there is a large deposit of fine sand on the home quarter, as well as a significant gravel deposits along the boundary of the SE and NE quarters. No exploration/excavation has been done other than for the owners use around the yardsite.